Taurus-Littrow Valley, the landing site of Apollo 17, as seen from an altitude of ~12 km from the Lunar Module (LM) Challenger window on the orbit before Power Descent Initiation (PDI). The Command & Service Module (CSM) America can be seen ahead and lower down in a relative position above the South Massif. A landslide of light mantle material lies about halfway across the valley entrance. At the foot of the North Massif at right is a triplet of moderately large craters named Henry, Shakespeare, and Cochise. The landing site is in the middle of the valley marked by the small white star to the left of these 3 craters. (NASA photo AS17-147-22467). 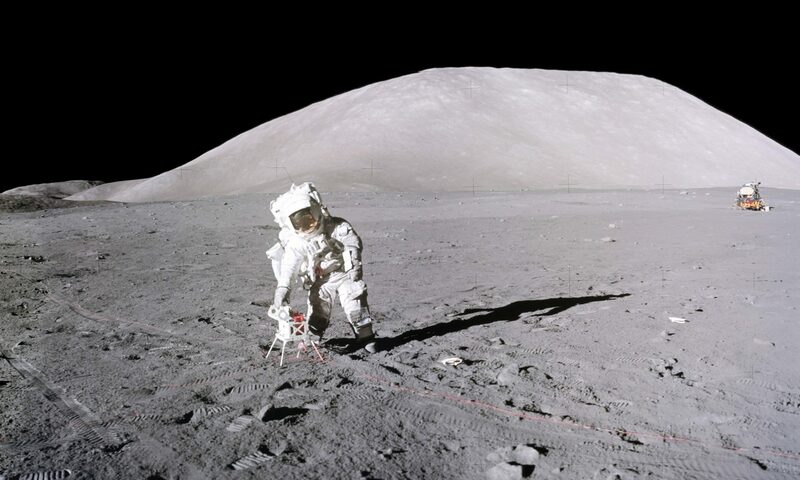 “A Valley on the Moon” constitutes the fourth installment of Apollo 17: Diary of the Twelfth Man, commemorating the 45th Anniversary of the December 7, 1972 launch of the Apollo 17 Mission. It is Chapter 10 of the Diary with other chapters to follow as soon as time permits, some of them out of sequence. This chapter chronicles EVA-1: the unloading of equipment outside of the LM Challenger; assembling the lunar rover (LRV), testing and loading it with the geological tools that will be needed; organizing the ALSEP packages for easy transport, and carrying them to the deployment site; emplacing the various experiments around the central ALSEP transmitting station; performing core drilling; the drive to the first geological exploration site at Station 1, and conducting investigations and samplings along the way; the lay-out of the cables for the cross-beam antenna of the SEP transmitter; and finally the return to the LM and close-out of EVA-1. As before, the liberal use of endnotes, distinguishing between subjects and sources is aided by the consistent use of different font styles and colors in the text. The first endnote of each chapter repeats the explanation of these color codes. To continue reading, click “8. Chapter 10…” under the main header in the “Pages” sidebar at upper right, or here. One can also begin the whole Diary by clicking on the header, “1. Apollo 17: Diary of the 12th Man”, in the “Pages” sidebar at upper right. The publication of Chapter 10 of Diary of the 12th Man coincides with Memorial Day remembrances of those who have given their lives in defense of our basic rights of “life, liberty and the pursuit of happiness,” of our Constitution to ensure that “government of the people, by the people, and for the people shall not perish from the Earth,” and of their comrades in arms. Within Chapter 10, there is a description of the 6th and most recent raising of the Flag of the United States of America on the Moon over 45 years ago. That flag is one among millions that will be flying this Memorial Day in honor of those who have preserved the Nation. Copyright © by Harrison H. Schmitt, 2017, 2018. All rights reserved.